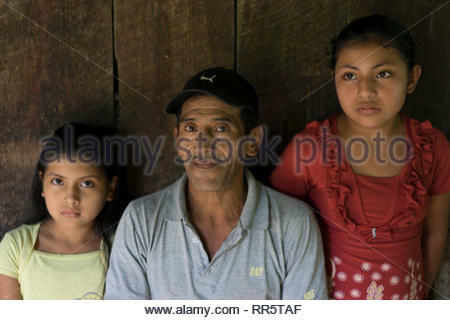 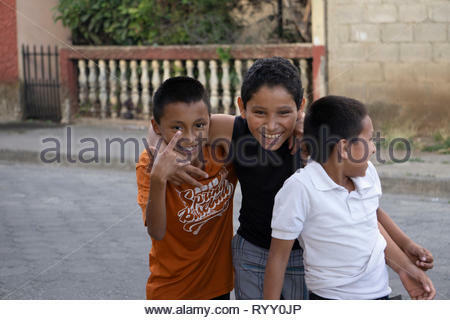 Three children in Jinotega, Nicaragua, act up for the camera. 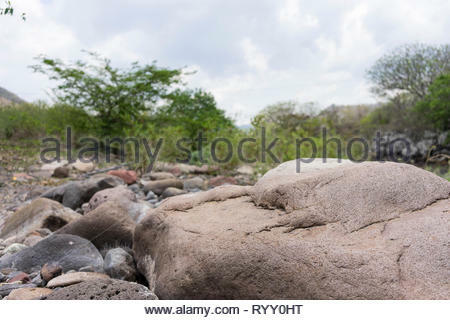 The dry season in Nicaragua, called 'verano' or summer, leaves river beds exposed between some residual pools, showing rocks like these. 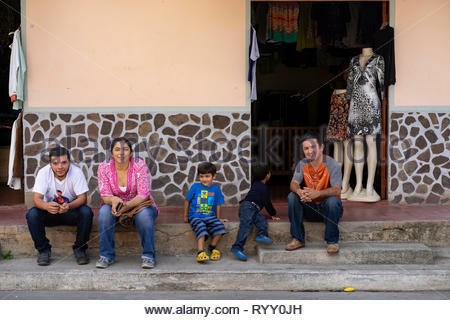 Shop-keeping family with children and merchandise showing through an open door. 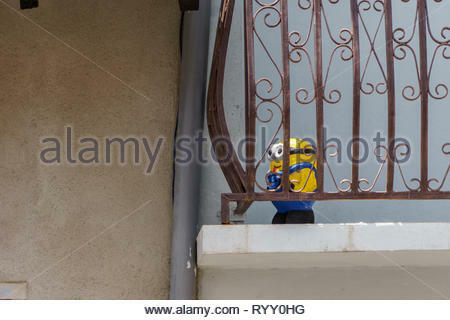 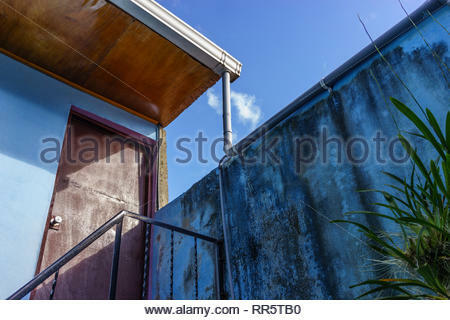 Popular culture figure stands on a balcony in Nicaragua. 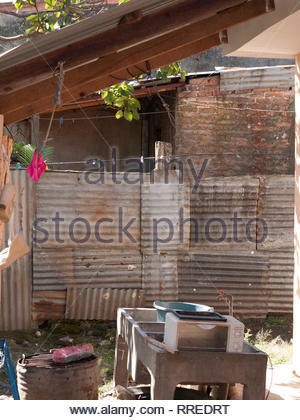 It appears to be a locally made copy of a US commercial marketing icon. 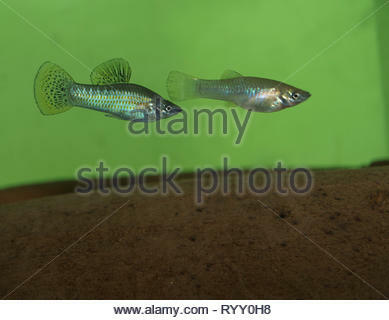 A pair of Mexican mollies (Poecilia mexicana) swim over a terracotta roofing tile in an aquarium. 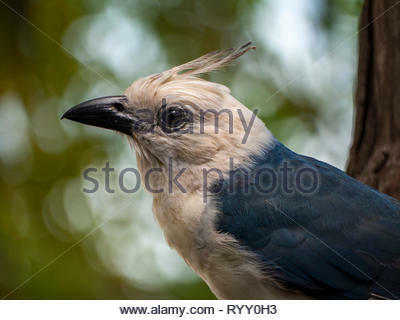 Leucistic white-throated magpie-jay comes close to beg for food. 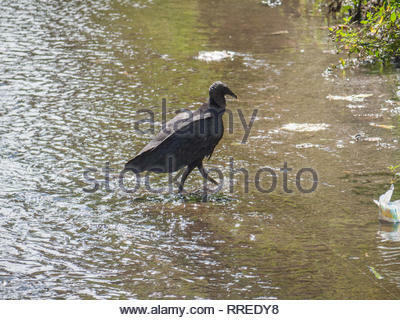 This particular bird was well know among birders who visited Ometepe Island. 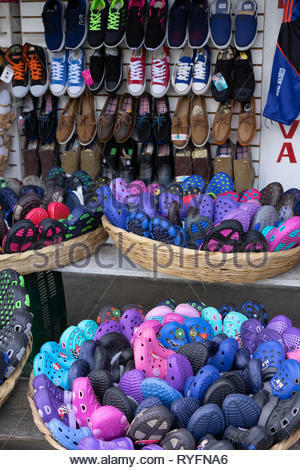 A street market stall is well stocked with plastic shoes before the rainy season begins. 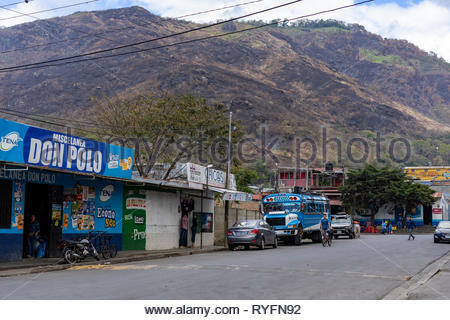 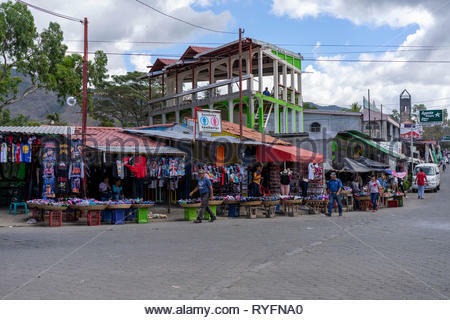 Unfinished building is surrounded by market stalls on a street in Jinotega, Nicaragua. 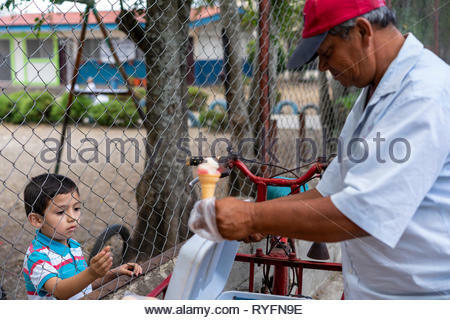 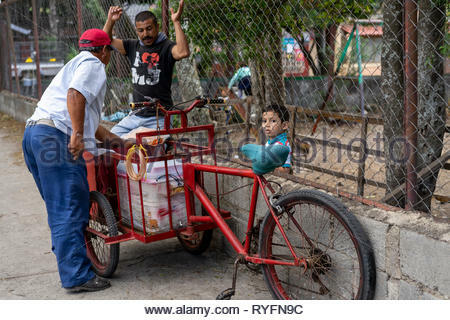 Elementary school student buys an ice cream cone from a bicycle cart vendor just outside the school fence. 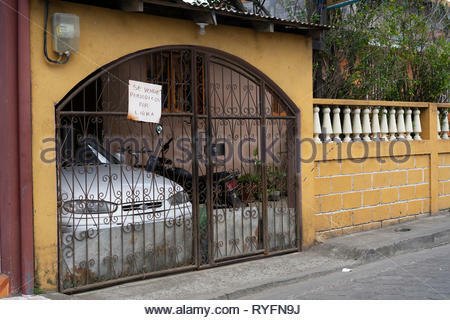 Magazines offered for sale by the pound at a house with a fenced in car port. 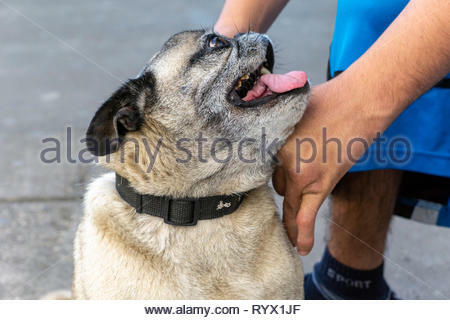 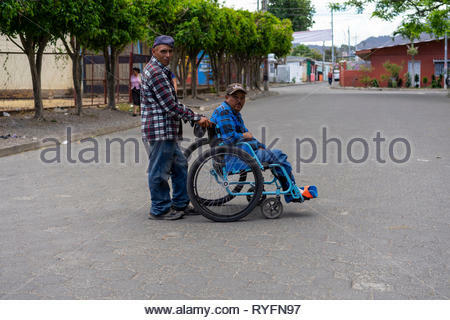 Man pushing another man in a wheel chair. 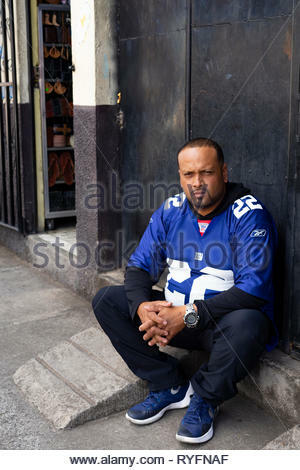 The man in the chair is old enough to have been in the Contra Wars. 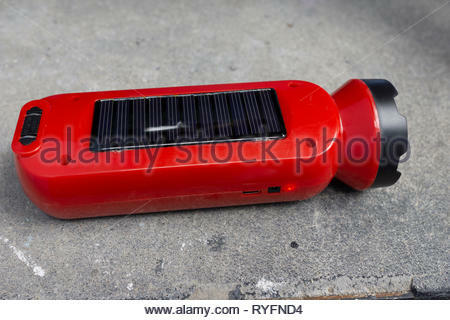 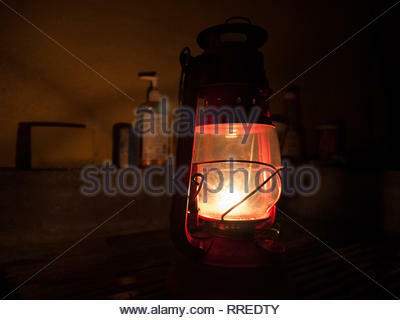 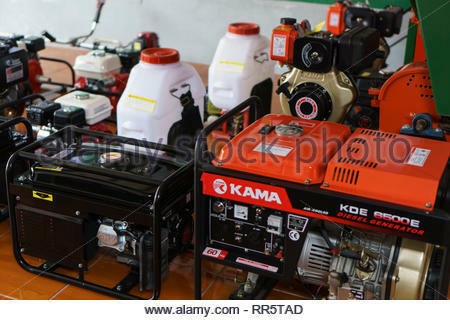 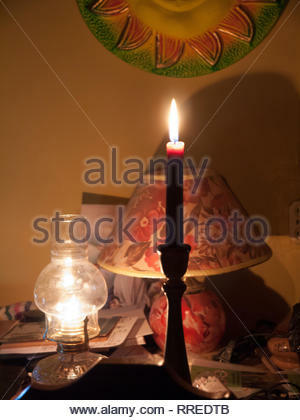 Chinese made flashlight uses an internal battery which can be charged by house current or by the solar panel on top or from a mini usb connection. 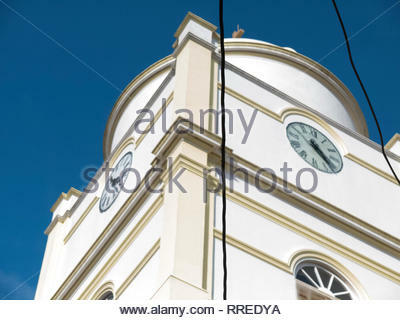 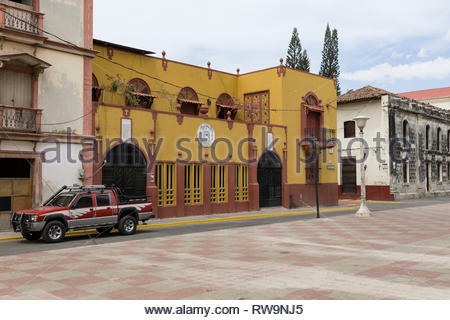 The Palacio Episcopal was designed by Marcelo Targa and one of the first buildings to display Leonese neoclassical architecture. 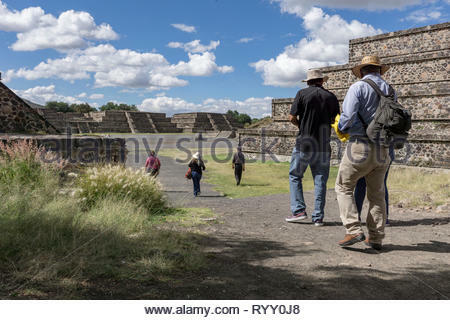 Tourists climb the Pyramid of the Sun at Teotihuacan, Mexico. 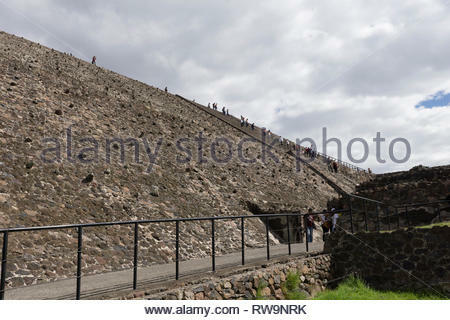 This pyramid is the third largest pyramid in the world. 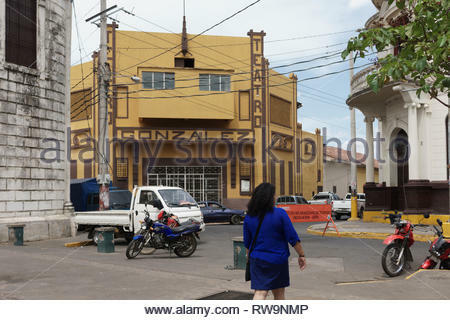 Street intersection in Leon, Nicaragua with cars and a truck and motorcycles with the Gonzales Theater in the center. 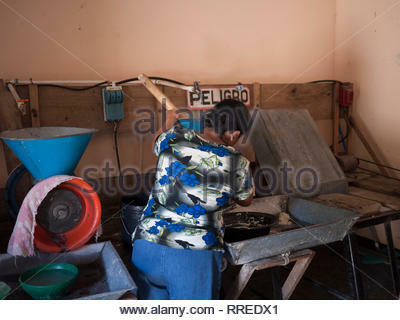 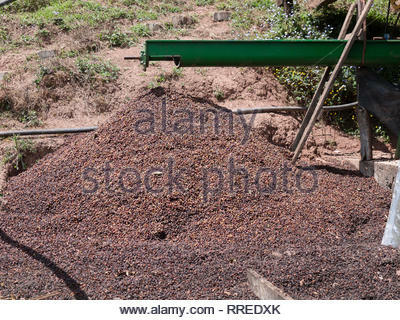 Coffee finca in Jinotega Department with wet processing vats under a wooden building. 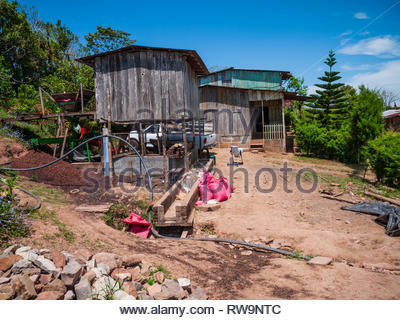 Farmhouse in rear for workers. 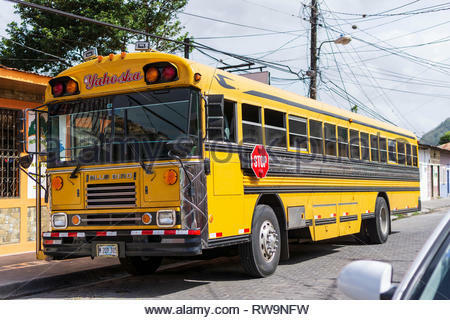 A bus from the Carribean Coast of Nicaragua brought in a Costeño baseball team which spoke Miskito, Spanish, and Creole English. 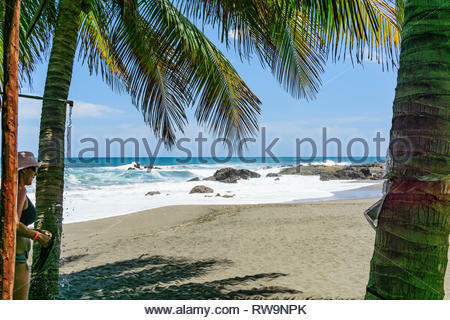 A woman showers after swimming in the Pacific coast surf at the beach at Las Peñitas, Nicaragua. 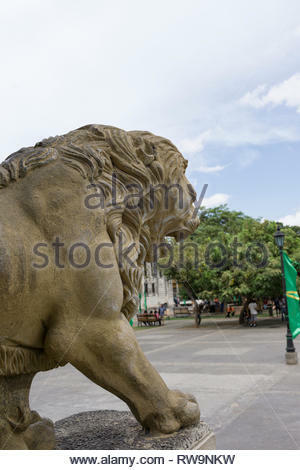 One of the sculptured lions of Leon (Lion in Spanish) looks out over a city park. 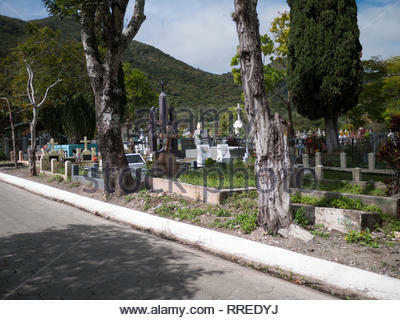 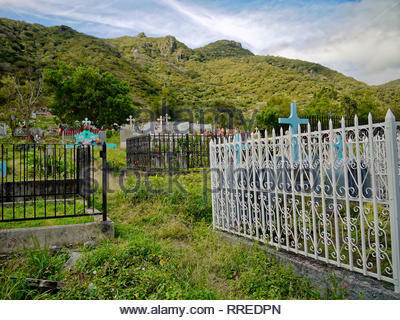 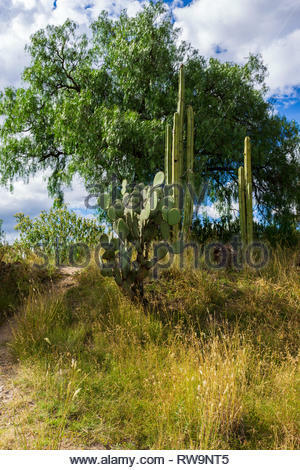 A path goes through cactuses, grass, and trees in rural Mexico. 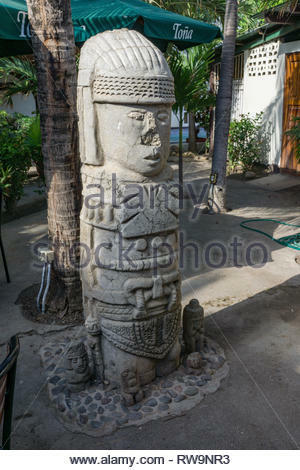 A pre-Columbia indigenous sculpture in a restaurant in Las Peñitas, a popular beach town in Nicaragua. 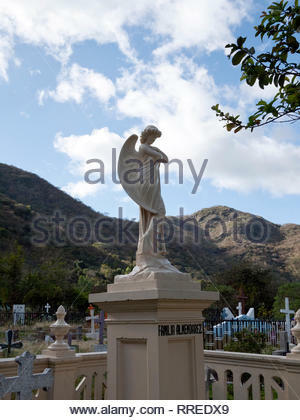 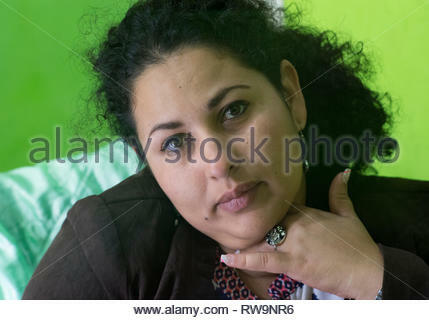 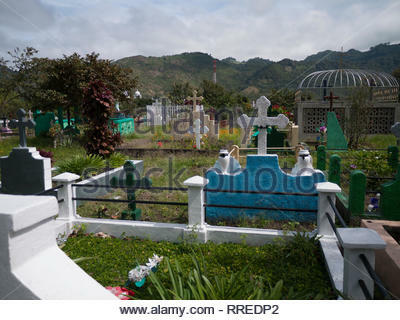 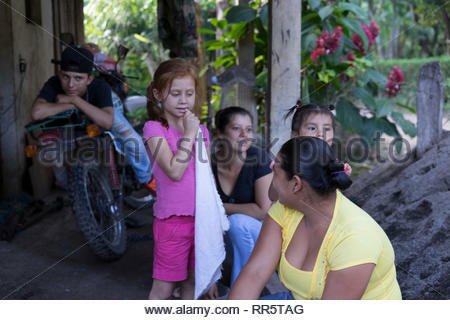 Nicaraguan adult woman looking pensive after hearing bad news. 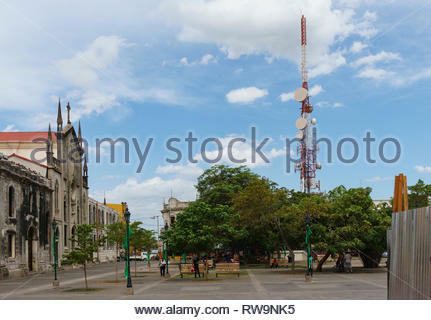 Modern tech and old architecture in Leon, Nicaragua face an urban park near the main cathedral. 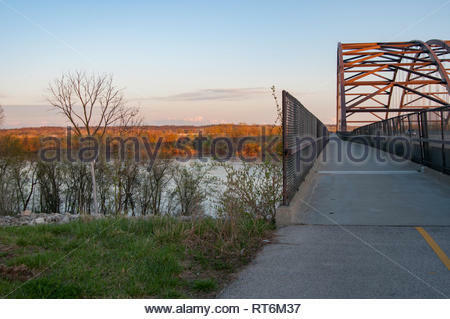 Sun set at the Missouri River near St. Louis. 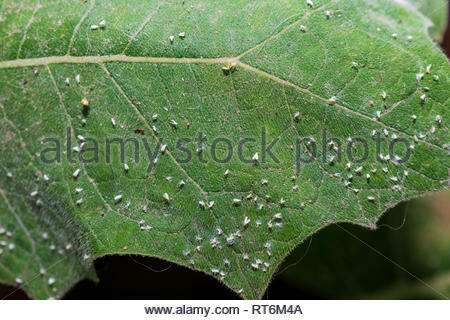 Whitefly infestation on a narajilla leaf. 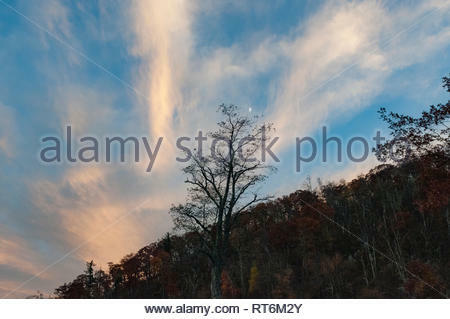 Half moon is visible at sunset in the Shenandoah National Park. 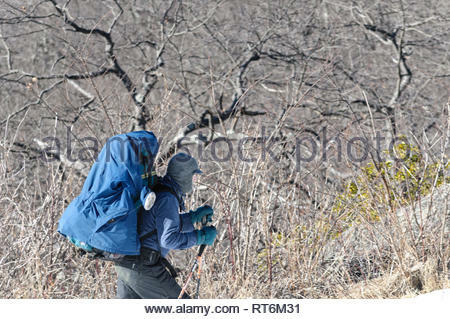 Hiker uses walking sticks to support himself and his pack while walking in the Shenandoah National Park. 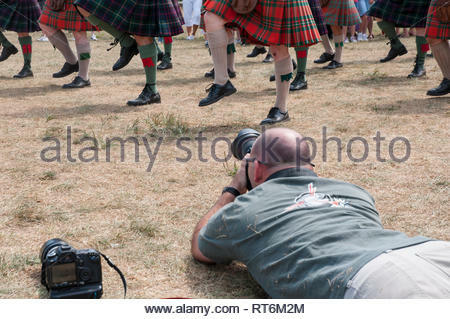 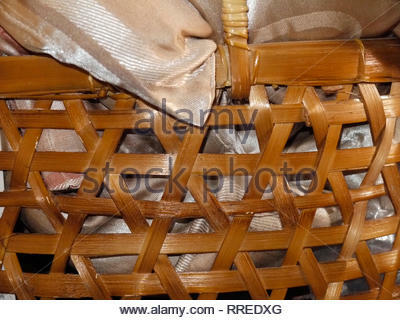 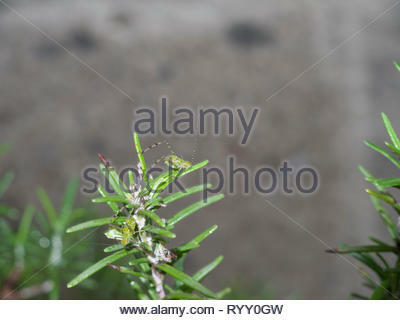 Photographer gets a low angle shot of marching bagpiper's legs and kilt hems. 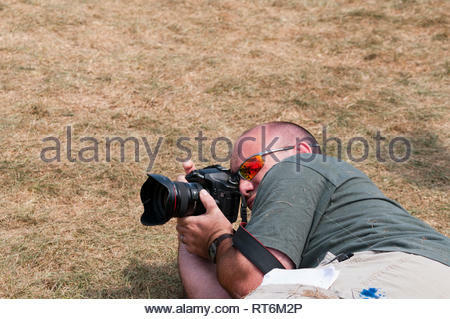 Professional photographer takes some low angle photos at Virginia Scottish Games in 2009. 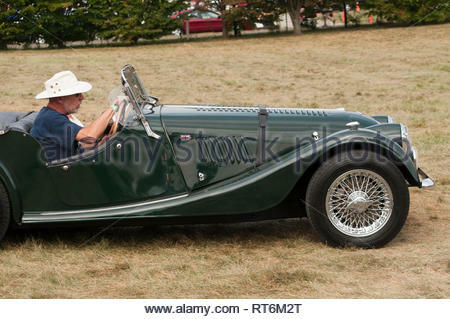 Man in a classic Morgan car with a hood strap at the Virginia Scottish Games. 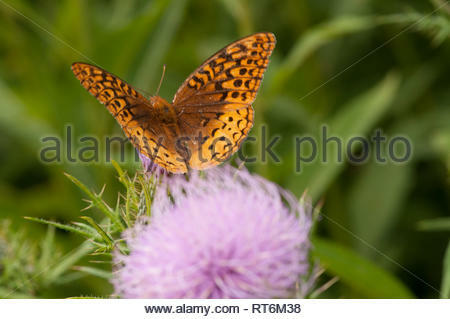 Great spangled fritillary feeding on a milk thistle flower. 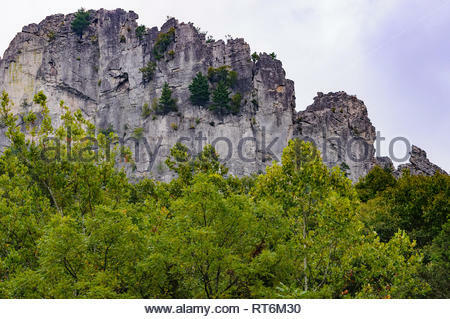 Seneca Rocks are a popular climbing area in West Virginia a half day's drive from major east coast urban centers in the US. 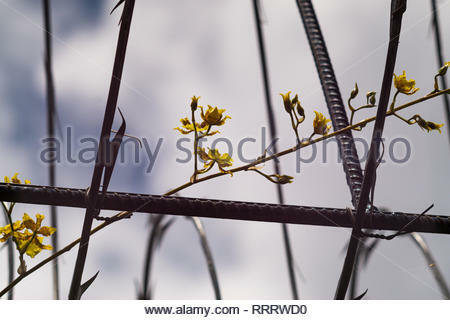 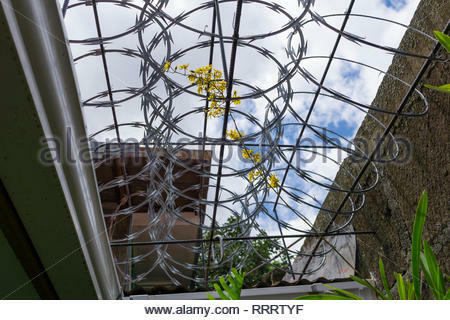 An Oncidium sends a flower spike through razor wire over a passageway open to the sky. 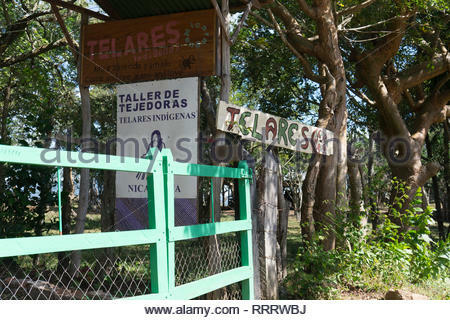 Entrance to weavery at El Chile, Matagalpa Department, Nicaragua promises to show backstrap weaving, but the production weavers use Sweden floor looms. 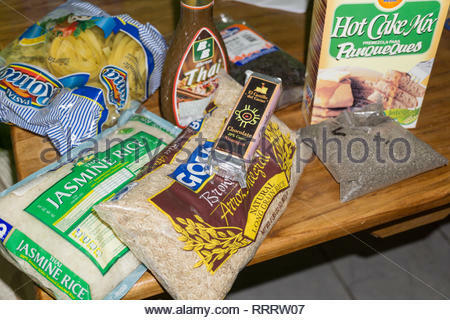 An expat's supermarket shopping haul shows both Nicaraguan packaged foods, including chia seed, and imported rice varieties and Thai sauce. 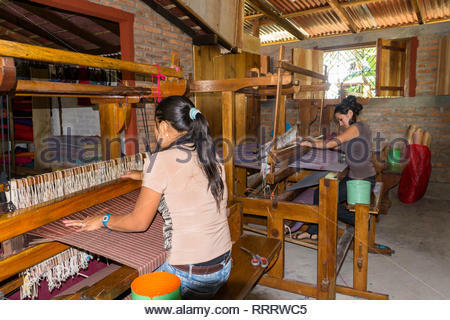 Two weavers on Glimakra floor looms produced yardage for crafts. 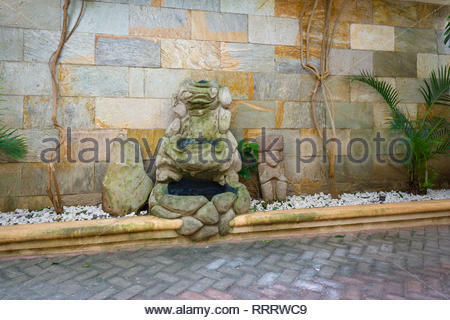 Indigenous and modern sculptures in El Borbon restaurant in Boaco, Nicaragua. 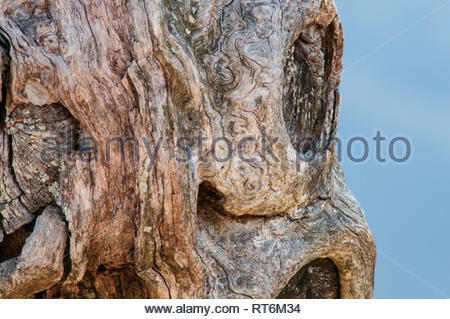 These small indigenous sculpures often look unpleased. 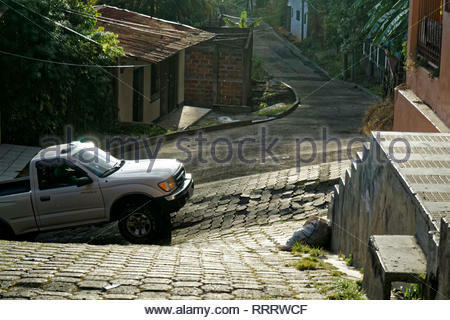 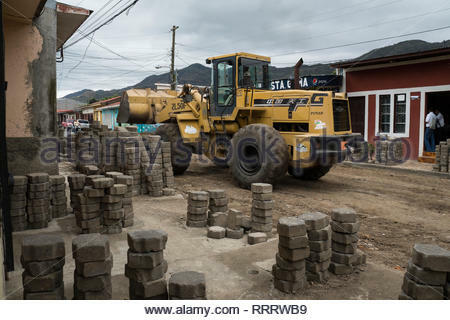 A truck comes up a a hill in Boaco, Nicaragua, the city of two floors (two levels). 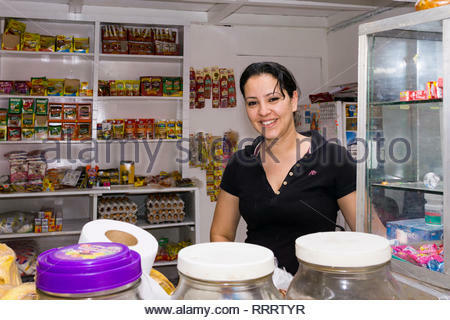 A Nicaraguan woman at her store's counter after a store renovation and expansion. 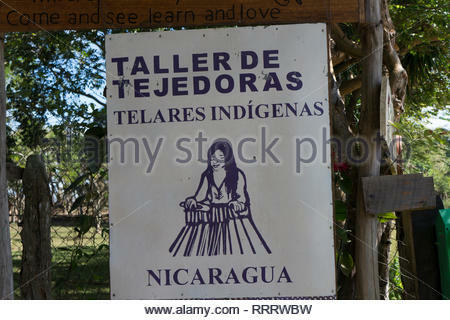 A older Nicaragua woman wears clothes reminiscent of indigenous clothing that's no longer handwoven here. 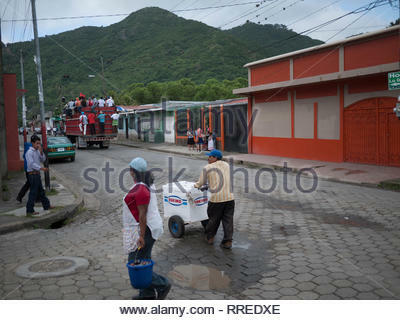 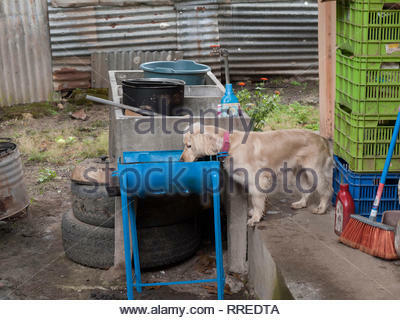 Jinotega municipal workers repairing the water system. 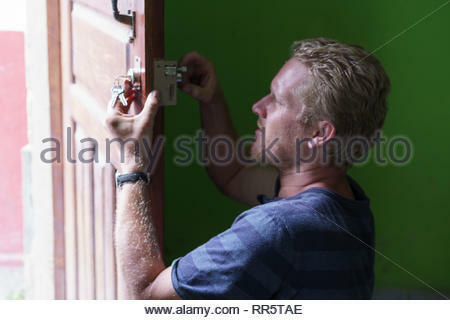 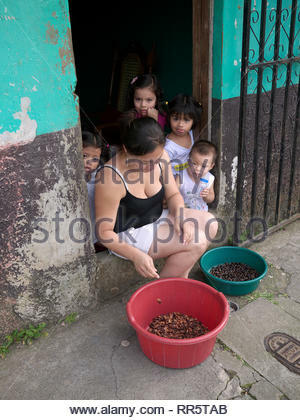 Nicaraguan woman holds her child in a old house in Managua. 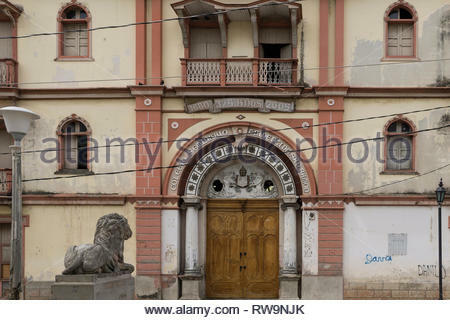 Art Deco building in Jinotega, Nicaragua was open as a hotel for a few years, now empty. 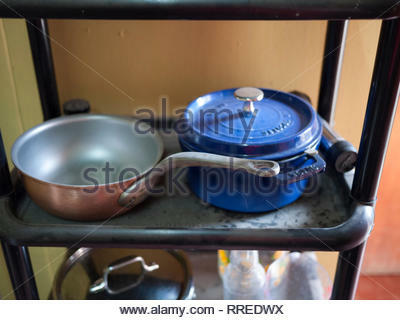 An expat's collection of imported cookware sits on plastic shelving. 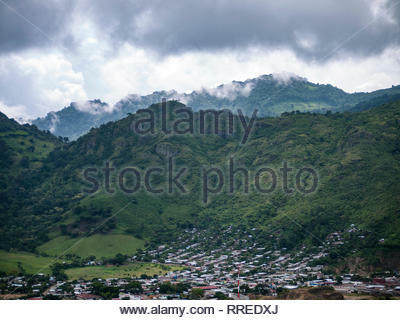 The Nicaraguan city of Jinotega visible from the mountains west of town. 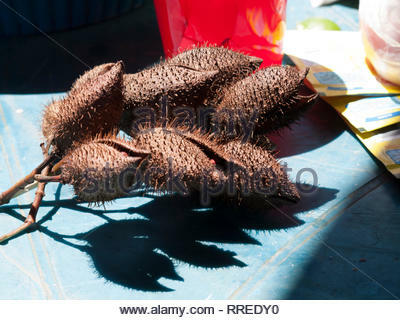 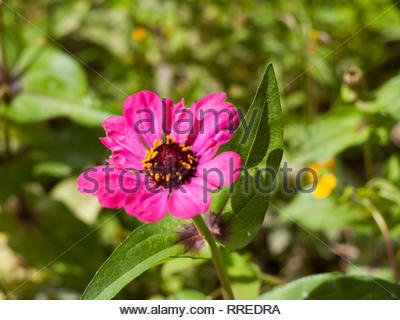 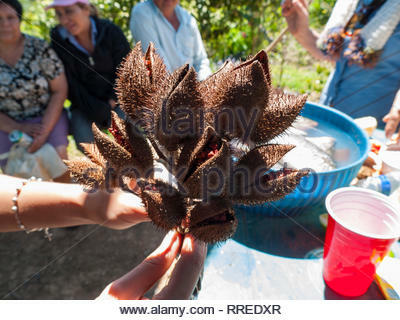 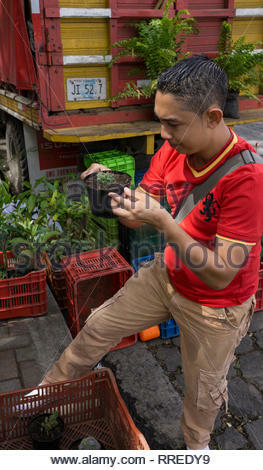 Plant seller in Jinotega's central park looks at one of the plants he's selling. 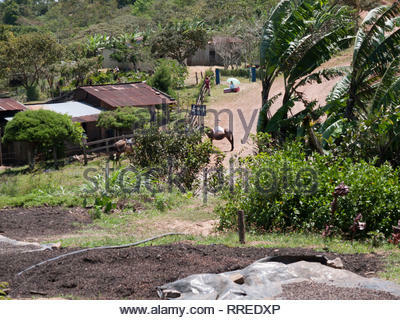 The sellers come down from the growing area in the mountains. 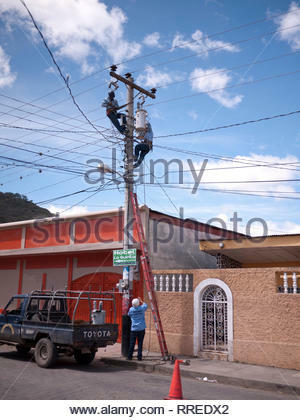 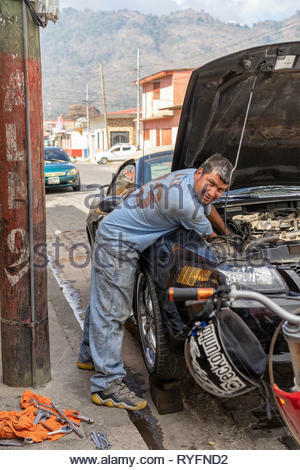 Electrical work crew change out a transformer in Nicaragua. 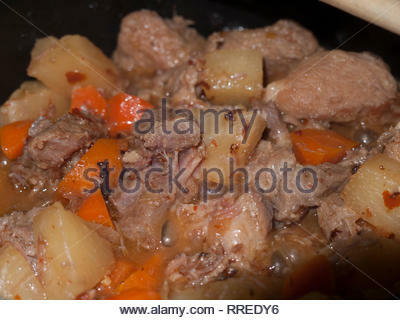 A pot of pork, carrot, and pineapple stew is cooking. 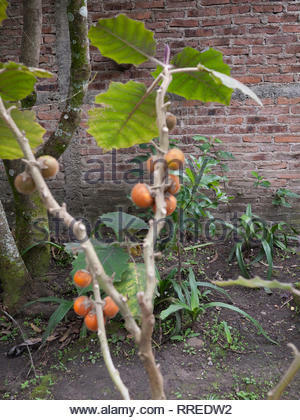 Naranjilla plant with fruits in a Nicaraguan highland garden. 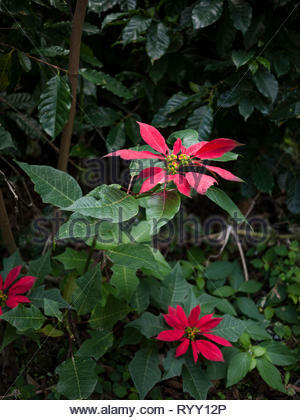 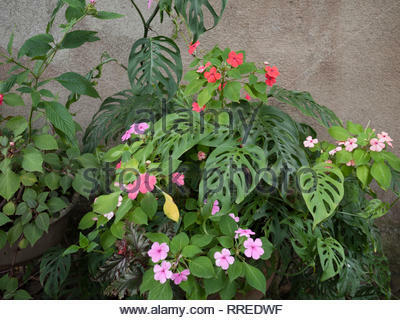 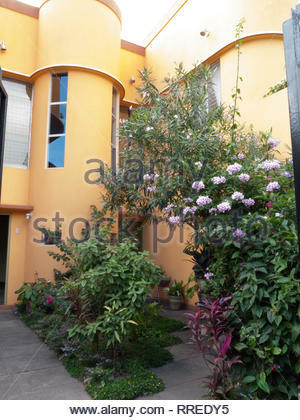 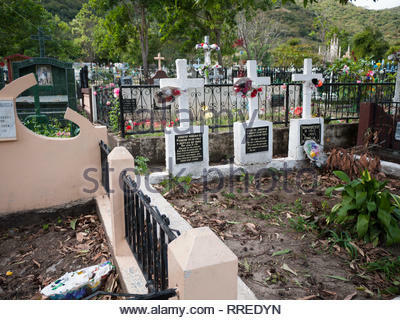 A private garden in Jinotega, Nicaragua, has impatiens and monsteras (also known as split leaf philodendrons) as the main plants. 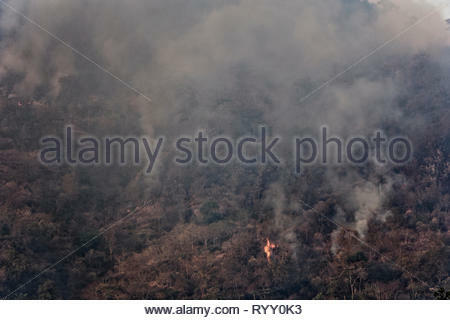 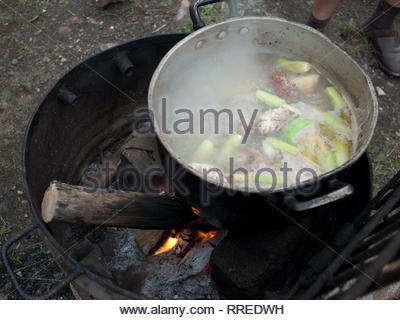 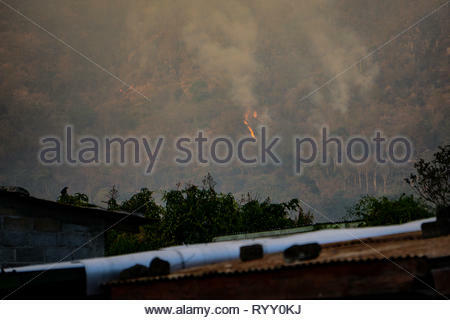 Sunday soup cooks over a wood fire in Jinotega, Nicaragua. 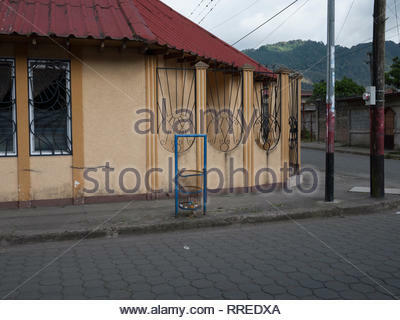 Jinotega house has more elaborate iron work than usual on the windows and doors. 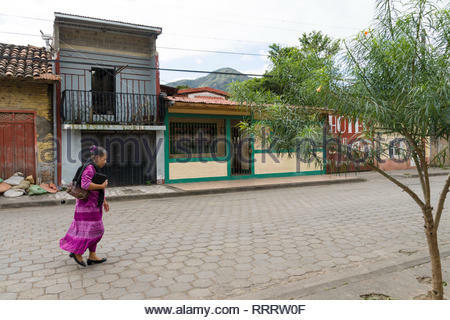 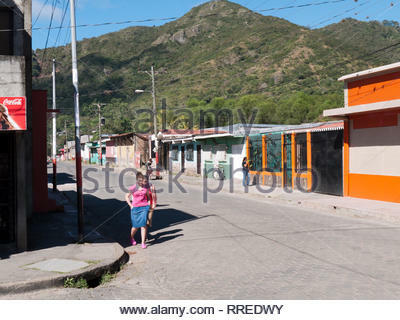 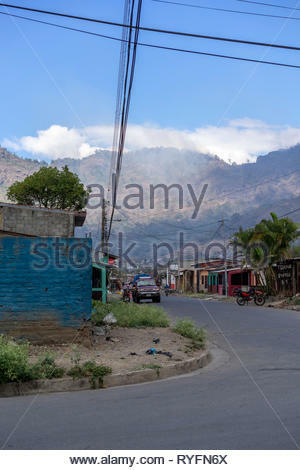 Two women walk by middle class houses in Jinotega, Nicaragua. 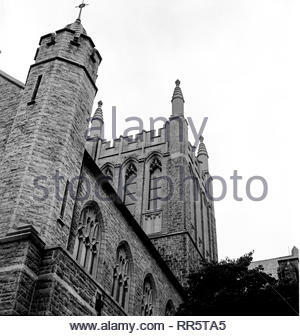 St Bridget's Roman Catholic Church in Philadelphia, PA on Midvale Avenue, East Falls neighborhood. 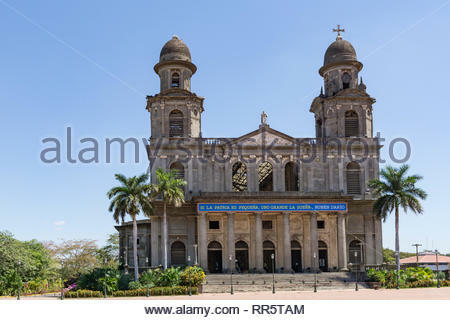 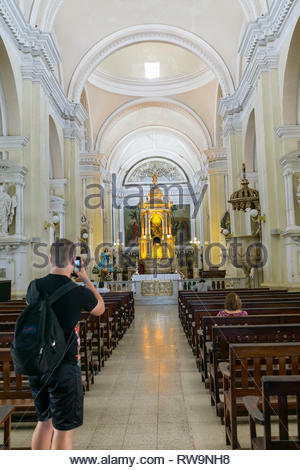 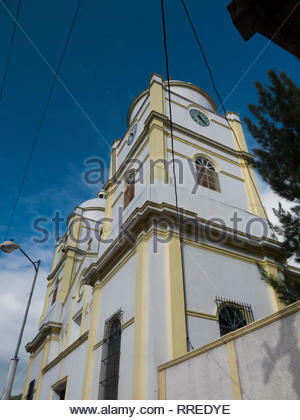 Managua's Catedral de Santiago was damaged in the 1972 earthquake that destroyed a large part of the city. 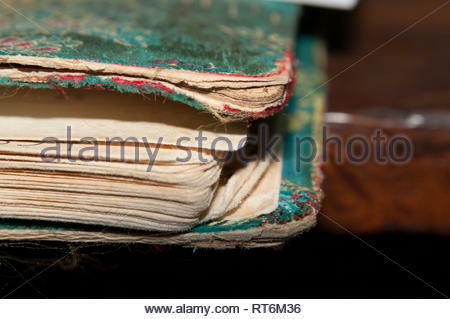 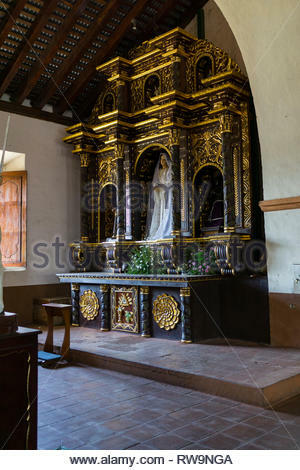 It was build from 1928 to 1938. 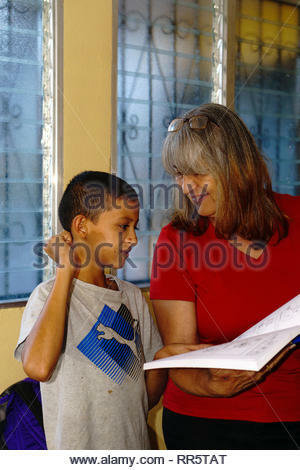 NGO employee and deaf boy look at a dictionary of Nicaraguan Sign Language at a shelter for the deaf in Jinotega, Nicaragua.